This architecturally designed house with straight lines required a landscape garden to work with its design. 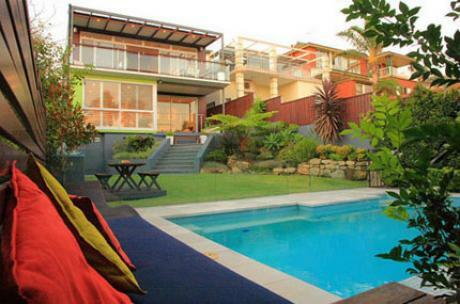 The owners wanted a modern stylish pool and landscaping to enhance the contemporary designed house. With a combination of timber decking, sandstone and lush foliage the end result was a lavish showpiece. A timber screen with hedging plants where chosen to conceal the boundary fence and add privacy from neighbours. The main garden was designed to incorporate the large bedrock situated in the middle into a rockery with plants selected for coastal conditions. With the kitchen and entertaining area of the house located on top floor taking advantage of the beach views a kitchen area was essential for this backyard design. A BBQ area with fridge and sink means the owners do not have to leave the backyard when cooking. The bench top was tiled to match the pool and merbau timber used for both decks. Linking the pool area and outdoor kitchen gave the owners hours of entertainment with family and friends.